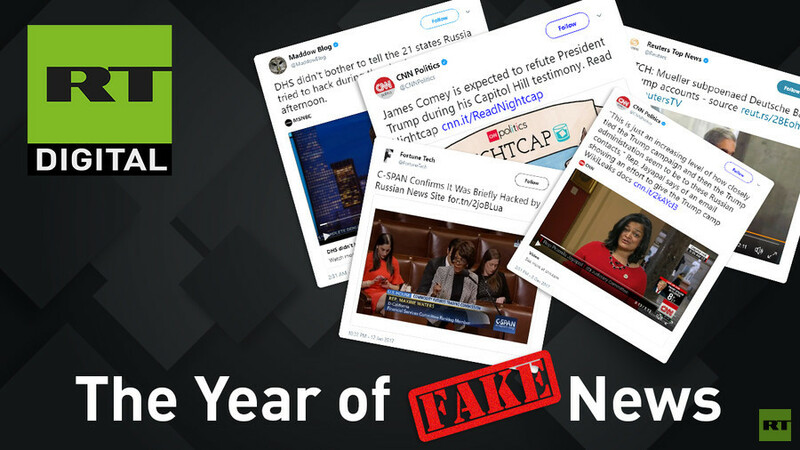 The fake news for 2017 kicked off in January with reports that Russia’s hacking had extended to infiltrating the US House of Representatives. When C-SPAN’s live coverage of proceedings in the House of Representatives on the Securities and Exchange Commission (SEC) was interrupted by an RT newscast in January, panic ensued. Fortune led the media charge, reporting C-Span had confirmed it was a Russian hack. Other news organizations reported on the interruption, not going as far as to say it was the work of the Kremlin, but causing panic nonetheless. In June, CNN reported former FBI head James Comey was going to deny President Donald Trump’s claims that Comey had told him on three occasions that he was not under investigation. The network reported Comey was expected to make the denial in his prepared testimony to the Senate Select Intelligence Committee. However, CNN was forced to correct this after Comey’s testimony was released before he appeared in front of the committee. It outlined three conversations he had with Trump in which he assured him he was not personally under investigation. CNN was forced to retract a second story in June, after it connected Trump’s former communications director Anthony Scaramucci to a Russian Direct Investment Fund managed by a Kremlin-controlled bank on June 22. It reported Senate investigators were looking at the fund in connection to Scaramucci, a former hedge fund manager, and other Trump associates. Three journalists resigned on June 27 after the network retracted the story, which had reported “Congress was investigating a Russian investment fund with ties to Trump officials,” based on an anonymous source. "In the aftermath of the retraction of a story published on CNN.com, CNN has accepted the resignations of the employees involved in the story's publication," the network said. The reports said the Department of Homeland Security told the affected states, citing Director of Wisconsin Elections Commission Michael Haas, who said it was the work of “Russian government cyber actors." It later emerged the story didn’t hold up. AP reported Wisconsin was told by DHS that it didn’t have its systems targeted. DHS then said an agency not related to the election process had been scanned by Russian IP addresses. ABC’s on-air news report claiming Trump ordered General Michael Flynn to make contact with Russian officials during the 2016 election caused the stock market to plummet on December 1. 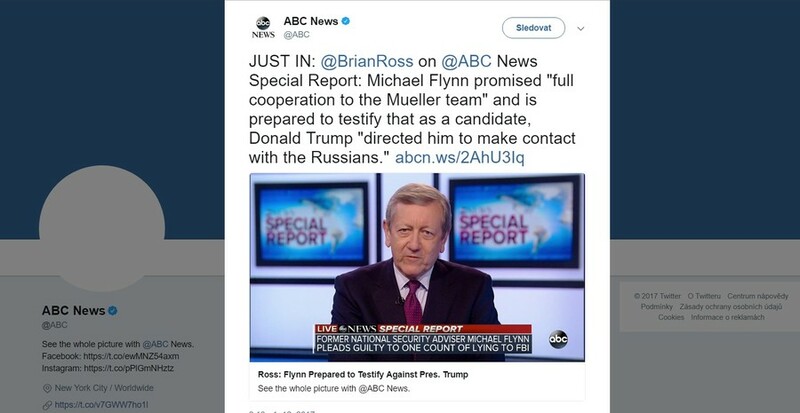 Investigative reporter Brian Ross said an anonymous source told him that an associate of Flynn was going to testify that Trump “directed him to make contact with the Russians” when he was a candidate during the election. A fairly juicy scoop indicating a relationship between a presidential candidate and a foreign government. However, Ross later corrected his report to clarify that the source later told him that Trump was actually the president-elect at the time of the conversation. 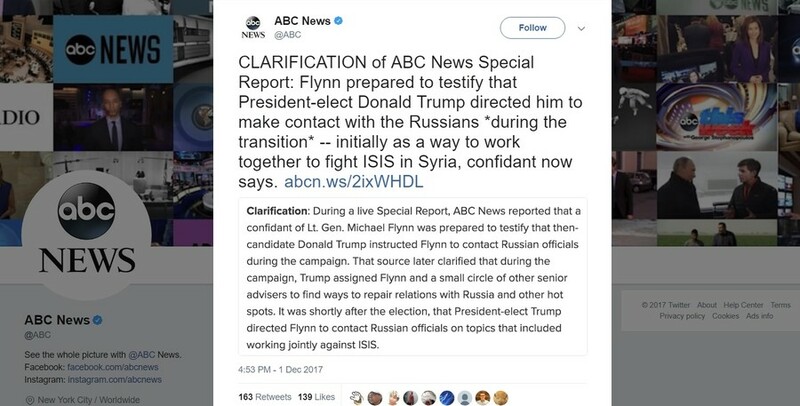 ABC tweeted a ‘clarification’ saying, “Flynn prepared to testify that President-elect Donald Trump directed him to make contact with the Russians *during the transition*,” and not before Trump won the election. Trump’s lawyers and the White House denied the reports. Bloomberg issued a correction, saying the subpoena related to records of people “affiliated with Trump.” AFP reported Trump’s former campaign chair Paul Manafort was the person in question, although this hasn’t been confirmed as neither Mueller nor the bank will comment. Manafort pled not guilty to charges including tax evasion and money laundering in October. CNN was left red-faced again after it reported on an alleged bombshell in the Trump-Russia story in December. The network’s ‘exclusive’ claimed the Trump campaign received an email with a decryption key and a website address to access WikiLeaks documents before they were released. The email was sent on September 4, CNN said, citing “multiple sources,” one month before WikiLeaks began releasing the emails of Clinton campaign chair John Podesta and 10 days before it released another batch of emails from the Democratic National Committee. However, despite other networks also confirming the story themselves, it emerged that the date of the email was in fact September 14. As for the files, the link and key had been shared by WikiLeaks to its millions of followers on Twitter the day before. It isn’t clear how so many news organizations got it wrong so many times in 2017, but the inaccurate reports all push the narrative that the Russians hacked the elections and colluded with Trump’s campaign. Another element that emerges is the suggestion that the journalists in question may have been fed bad information, as many of the media reports came from anonymous, likely insider, sources.